Le flip flop dell'estate 2014 sono queste: decorate con macro fiori, mille strass e pietre colorate. Perfette per la spiaggia e per un party estivo vi renderanno assolutamente visibili! Flip Flop Summer Wreath has 14-18 flip flops blinged out with TONS of rhinestones, a few crystals (for extra bling) and flowers galore! It's a stunning wreath for your home this summer. Perfect for your summer home as well! The bling is sure to make a shimmering entrance for anyone. You can also add a wooden welcome sign or a large initial letter blinged out in the center if you would like for only $22 more! 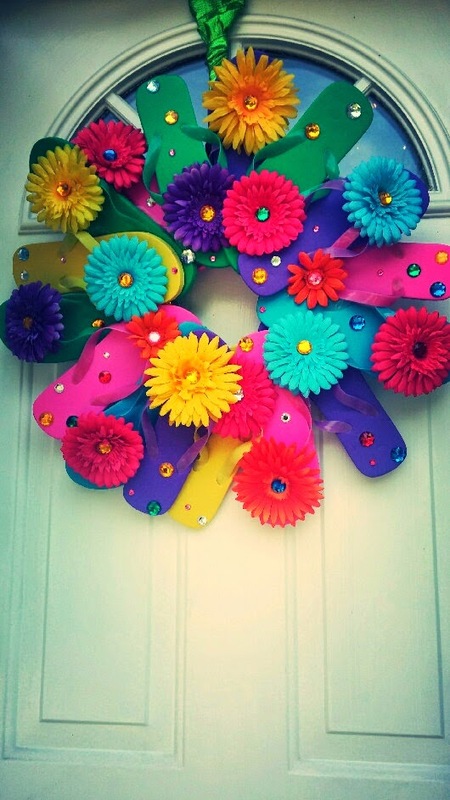 Welcome your guests into your home with a super fun summer feeling at your front door! Le flip flop di Francesca sono state indossate da molte celebrities da Real Housewives di Orange Country, star di American Idol e pubblicate su numerosi giornali e riviste.